One of the exciting news every media talks about now is the Japan women’s national foot ball team’s victory in the World Cup 2011. Japan’s female foot ball team is called by a nickname “Nadeshiko Japan” after a plant, yamato nadeshiko, which is known as fringed pink and also a figure of speech for the beauty of Japanese women who are modest but have inner fortitude. This elegant named strong team defeated the U.S. in the 2011 FIFA Women’s World Cup Final and became the first Asian team to win the Women’s World Cup! This video shows the penalty shootout in the final; Japan vs. U.S.. It is the moment that Japan defeated U.S. team and won the World Cup. Although not so many people had been interested in women’s foot ball games before this year’s World Cup, the team’s powerful performances gained a lot of new fans. According to escala café’s internet survey, 66.8% of women said that Nadeshiko Japan is “interesting” while only 17.5% women were interested in the team last year. 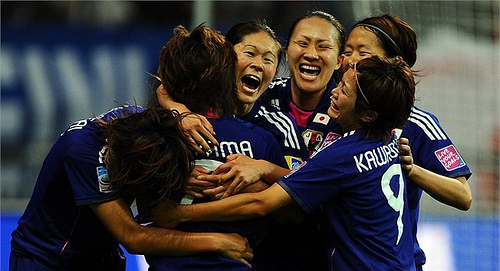 Hopefully, Nadeshiko Japan makes another victory in the London Olympic in 2012. Create Your Own “Cool” Mt. Fuji!